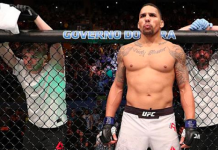 On Saturday night, on the main card of UFC Lincoln, former college football star Eryk Anders sought to rebound from the first setback of his MMA career, a close decision loss to former champion Lyoto Machida. He did so in incredible fashion, decapitating his opponent Tim Williams with a perfectly timed head kick in the third round. In the wake of this incredible victory, Eryk Anders called for a fight with Canadian middleweight contender Elias Theodorou. Theodorou, who is always active on social media during big fights, heard this callout and quickly responded. He reminded that he’s currently booked for a UFC Sao Paulo scrap with Antonio Carlos Junior. No matter the outcome of this bout, Theodorou says he plans to fight at UFC 231 this December, which goes down in his hometown of Toronto. 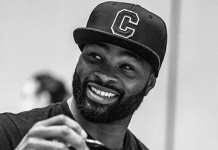 He implied he’d welcome a fight with Eryk Anders on this card. Eryk Anders then responded to this Tweet from Theodorou, assuring that he’d see him in Toronto. 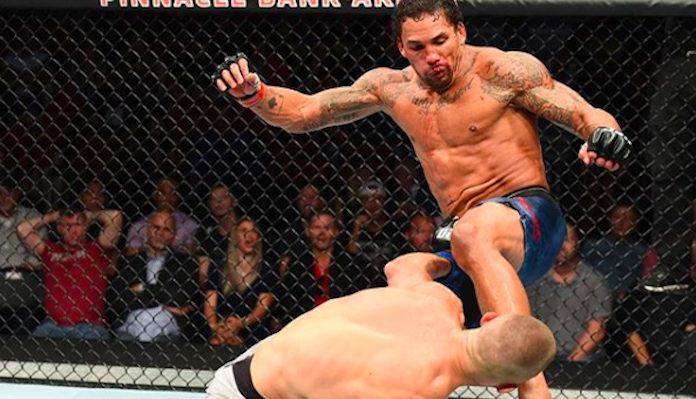 With his brutal knockout of Tim Williams, Eryk Anders improved to a strong 11-1 overall. His last three wins have occurred in the UFC’s Octagon. Prior to his move to the UFC, he won the LFA middleweight title. Elias Theodorou, meanwhile, is currently on a two-fight win-streak, having recently defeated Dan Kelly and Trevor Smith by decision. He’s 15-2 overall. 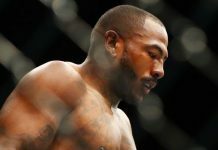 This article first appeared on BJPENN.COM on 8/26/2018.